We are now up to 27 participants signed up to the programme with 11 having been signed off. We have enquiries from three new possible participants which we will be following up in the coming weeks. That would bring the total to 30. We will also be starting a six week programme at the Women’s Refuge around Healthy Lifestyles. This usually brings in a number of new participants. During the summer we attended the Recovery College presentation day, and it was very rewarding to see four of our participants presented with certificates for attending a variety of workshops. Continuing on from our health and well-being workshops with Steps participants, we are also working towards setting up a support group for individuals to move onto when the have finished on the Steps programme, together with a closed Facebook page for participants to opt into. 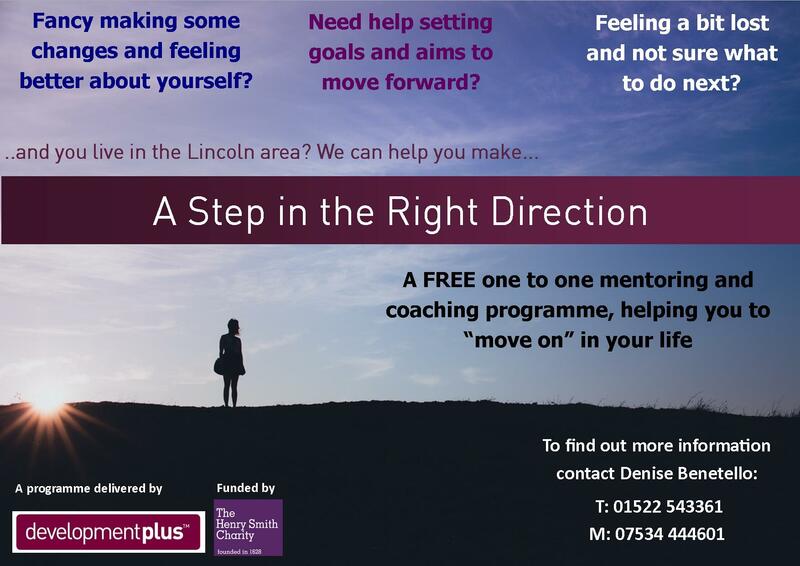 Thanks to our new Bromhead Medical Charity and Lincolnshire Community Foundation funding, we are running another STEPS (A Step in the Right Direction) programme in Lincoln and surrounding area, between July 2017 and August 2018.
to feel good about themselves, whatever circumstances they find themselves in. To deal with life’s challenges, building resilience and personal well-being. To give voice to their hopes, creating their own path towards their own goals. 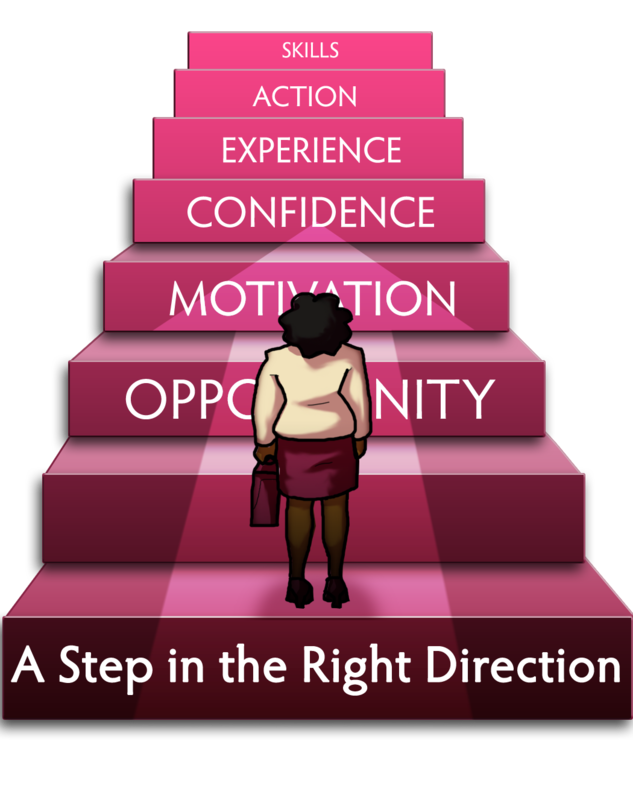 To be confident in their abilities, and to be motivated by the success of their actions. We give long-lasting emotional and practical tools that supported people back into work, into becoming involved in their local or wider community, into a healthier frame of mind and lifestyle. 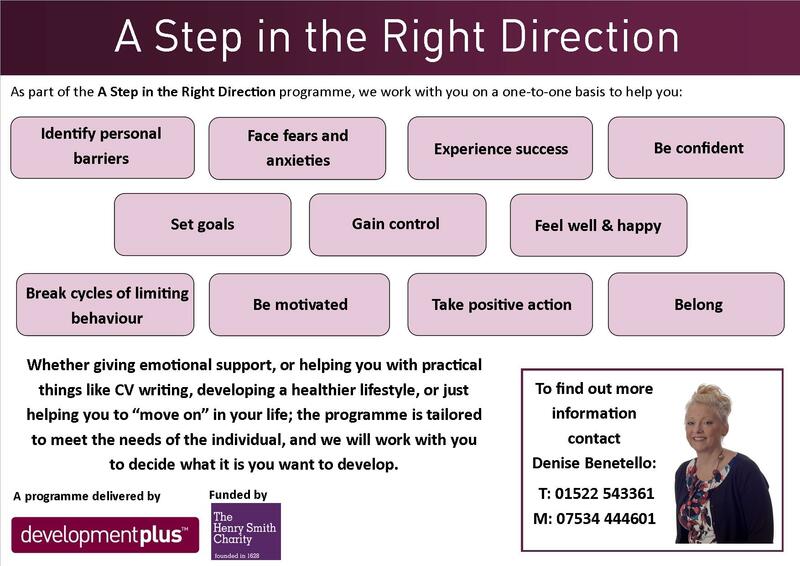 Whether giving emotional support, or helping you with practical things like CV writing, developing a healthier lifestyle, or just helping you to “move on” in your life; the programme is tailored to meet the needs of the individual, and we will work with you to decide what it is that you want to develop. If you live in the Lincoln area, we can help YOU make A Step In The Right Direction.